Deep-Clean, Repair & Seal 100M2 Slate in Kent. Adrian and his team were fantastic from start to finish. Hugely professional in every way; we highly recommend them. Adrian was tasked with cleaning, repairing and sealing our indoor black slate floor that we had regretted having laid until now. Having completed the floor, it is like brand new and massively improved. It is now a pleasure to have! Aside from being fantastic at the job in hand, Adrian and team were polite, respectful, considerate, on time, tidy and great at communicating. Once the slate floor was restored Bond Stone Cleaning returned to restore the outside areas to great effect. Please see outside section for more details. Work Details: The above testimonials says it all, totalling around 100 Square Meters of Slate with some damaged grouting which was also repaired before sealing. We were very pleased with the work that Adrian did for us. So very happy with his attention to detail and cleanliness. He made sure we understood what he was going to do and did. Highly recommended. Work Details: Mr Wilkin’s downstairs WC was around 1x2.5 Meters, the Marble had gone dull and had not been sealed when installed. 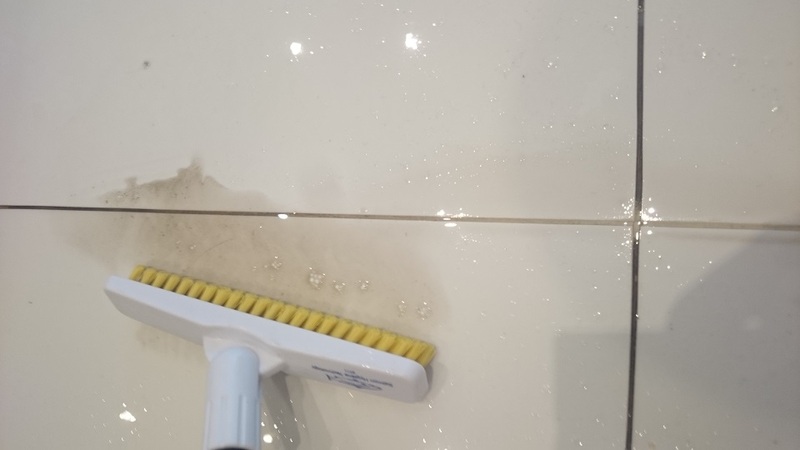 On the initial site visit the process was explained, deep-clean, diamond polish to a shine but not very high shine level as requested then sealed to help protect the Marble and grout lines. The quote was accepted and the work booked in. On arrival the carpet was protected and a mat was placed outside to ensure nothing marked the stone steps. The work was carried out as above and aftercare advice given payment was received and the above testimonial arrived in the post a few days later. Travertine Floor Restoration with Eco products in Greenwich. I really appreciate the professionalism of Adrian. He always responded promptly to emails, he explained every step and answered all my questions. On the day both he and Jude have been a pleasure to have in my house and I can’t say that for many tradespeople. Best of all the floor now looks amazing! I thoroughly recommend Bond Stone Cleaning. Work Details: A full restoration including Deep-cleaning, diamond polishing, filling the holes and sealing. There was also some damage on the Travertine bath panel caused by bleach which caused white streaks which was treated with Stone Oil and made it look much better and protected it for the future. Due to a Yonge baby in the home Eco products were used to avoid the smell of chemicals in the home, these are often used and can be requested although for some issues the product you may need may not be ECO, for example the Stone Oil is not eco however only a very small amount was used. Bond Stone have completely renovated both my Kitchen and shower flooring. An excellent service completed by the company and I would not hesitate in providing a full recommendation regarding their service. Before cleaning the grout lines were dirty and the tiles were Dull and hard to keep clean. The incorrect cleaners had been used. Once completed aftercare advice was given on how best to look after the Travertine, along with the correct daily maintenance cleaner. 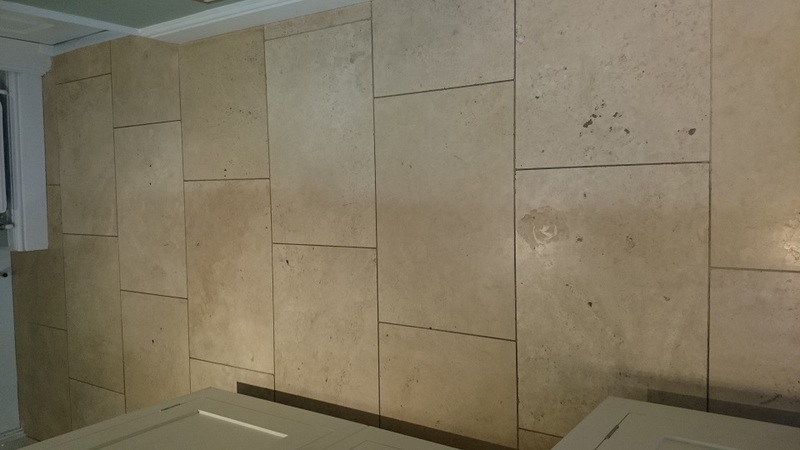 Work Details: This Travertine Floor had been down for just over 2 year, in that time many holes had appeared and the floor was looking dull. After cleaning and polishing the floor Mr Yeadon said it was “better then new”. Full aftercare advice was given and a regular maintenance cleaner was left to ensure the floor looks great for years to come. The Mosaic Marble shower area was deep-cleaned and sealed. Carmel, Keston Park, Kent, - Travertine Restoration, Filling, Polishing, Sealing. 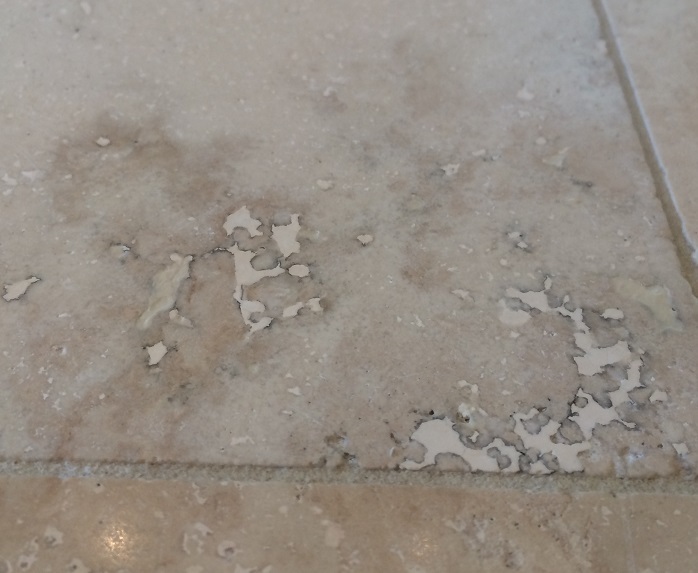 Work Details: As is common with Travertine Tiles hot of holes and cracks had appeared over the years, also it had lost its shine and looked dirty. The above images show how the specialist stone fillers matched the stone colours so the holes disappear back into the stone. The floor was also deep-cleaned and polished. Adrian and his team were polite, efficient , hardworking and very respectful of our home. They took great care in keeping the rest of our house clean. 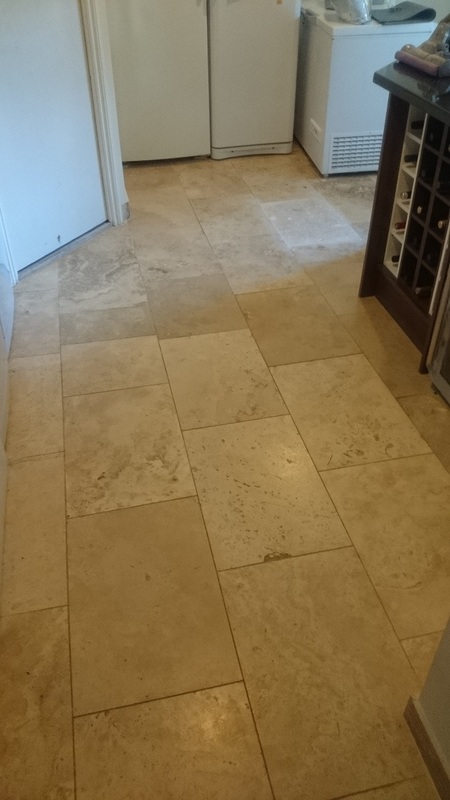 The Travertine floor in our kitchen is now in a much better condition than even the day it was originally installed. It is also much easier to keep clean. I highly recommend Bond Stone Cleaning. Many Thanks. Excellent! Very professional and informative and most importantly, great results. My tiles are like they are brand new. I would definitely recommend, and also use again. Excellent job, the floor came up really well with the clean. Helpful advice and efficient service. Once again many thanks for your time and effort yesterday, it was much appreciated and the floor looks so much better! I am also pleased that we now have proper instructions on how to look after the floor going forward. Before cleaning the grout lines were dirty and the tiles were hard to clean. There were also areas where the grout had come out. 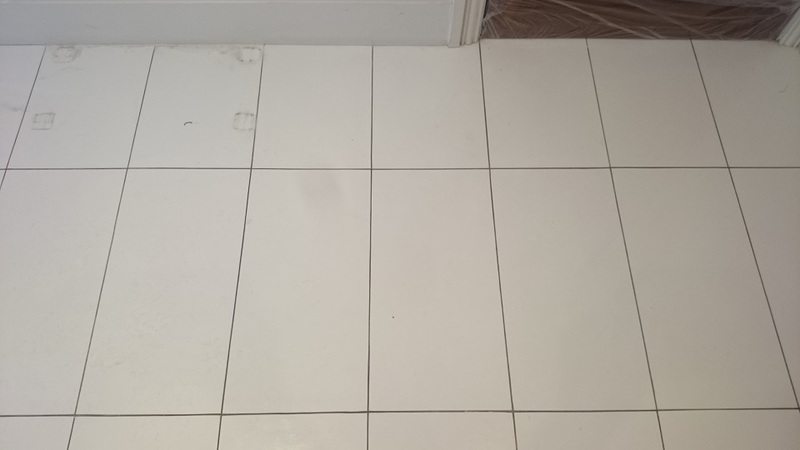 The whole porcelain floor was deep-cleaned and the grout lines were cleaned with grout brushes. The left of the photo shows the cleaned section and the right the before cleaning. 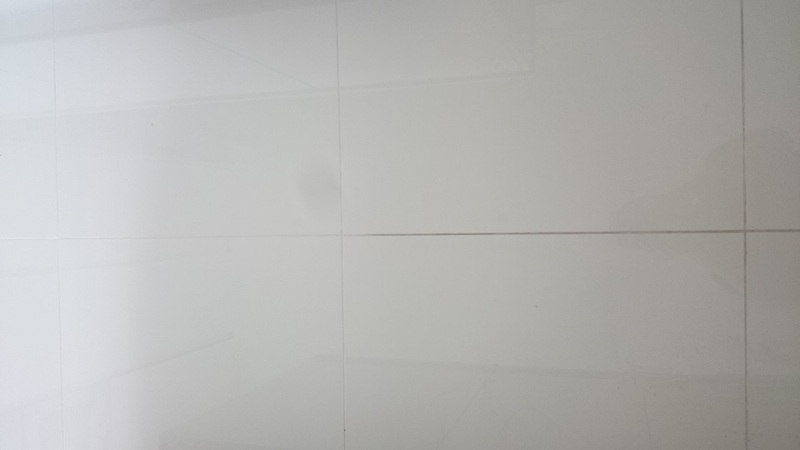 Work Details: The Porcelain floor had been laid a number of years prior but had never looked clean. The tiles were also not cleaning as easily as they should. The floor was deep-cleaned, the grout lines were cleaned with grout brushes and then the floor was washed and the water vacuumed up. Once dry the floor was sealed with an impregnator seal designed for Porcelains, the excess was buffed off. The floor also had a number of areas which had missing grout, these were re-grouted and sealed. Finally the floor was buffed over to finish and details on how to look after the floor were given. They were a joy to have in the house. Always polite, courteous and very professional in his work. 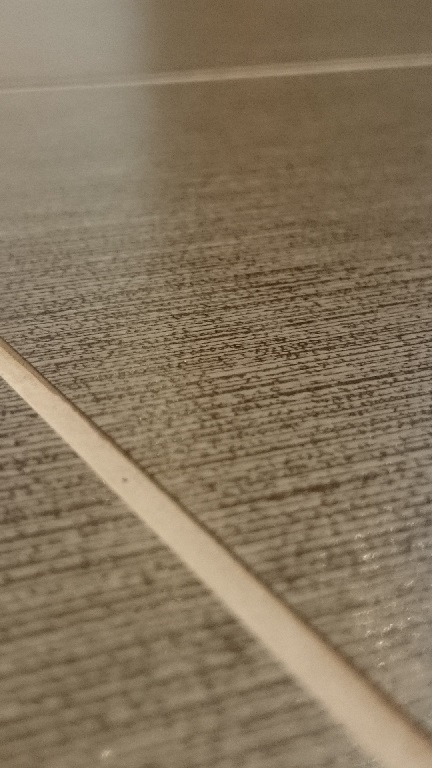 He worked tirelessly to remove the incorrect seal that had been applied by a pervious contractor and filled numerous amounts of cracks to an excellent standard. 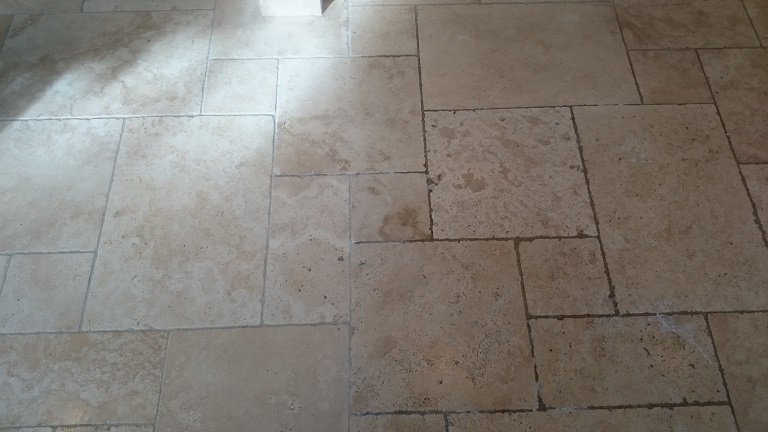 Mandy - Mereworth, Kent, - Ground Floor Travertine Restoration. 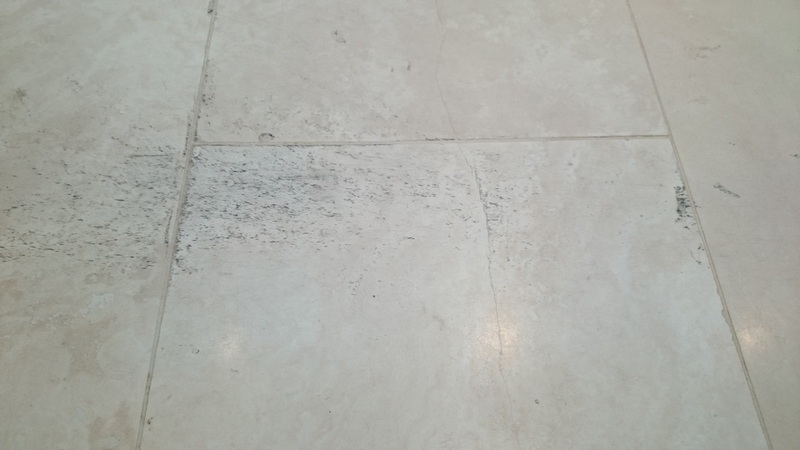 Work Details: The Travertine Floor had been sealed with the incorrect over-seal which acted like a varnish, this not only scratched and marked easily but the beauty of the Travertine stone was lost. The first job was to remove this seal with a seal-remover, then the stone was deep-cleaned with specialist stone cleaners, the diamond polished and sealed. Limestone Floor Restoration, Deep-Clean and Re-Polish. We were extremely pleased with our limestone floor. The before and after is unrecognisable and we will definitely use Adrian again..
Great service. Efficient, friendly. Our floor 8 years old is now as good as new. If Not Shinier! Thank you. Extremely professional. Brilliant advice given to look after our floor. 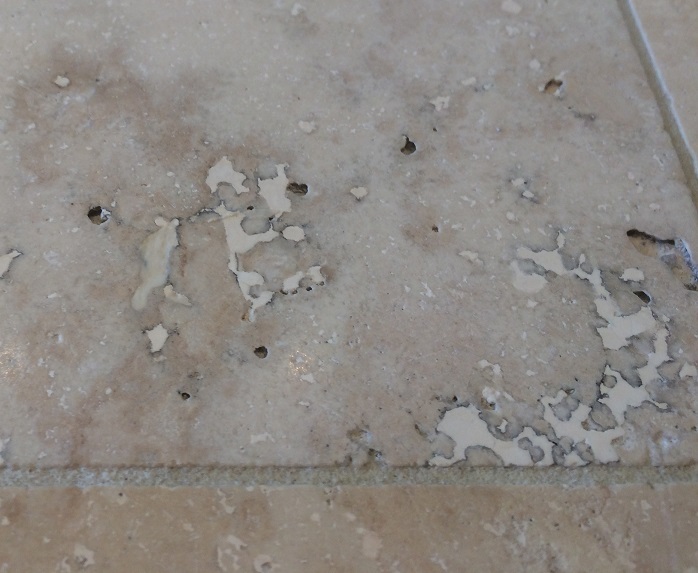 Work details: Laid around 8 years prior to restoration, over this time a lot of holes had appeared and these along with the grout lines look dirty also the top of the stone was dull and lacked beauty. 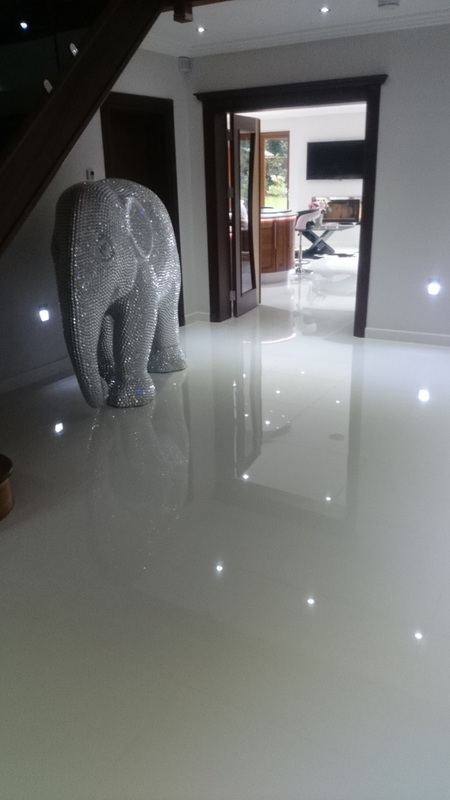 The floor was deep-cleaned, the holes were filled with specialist stone fillers and the whole floor was diamond polished to bring the shine back. The floor was then sealed with an impregnator seal and buffed to finish. After the restoration full details on the aftercare and on-going maintenance was given to the customer to help it stay looking great. 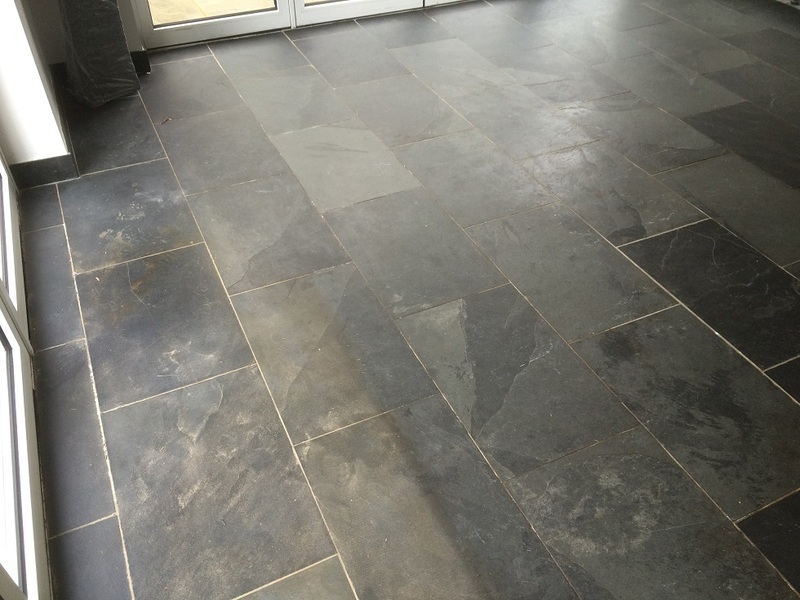 Our slate floor was very dull after 15 years of seal and dirt. They stripped all the old seal and resealed. Now looks better then new. Excellent result and very food service. Great attention to details. Highly recommended. 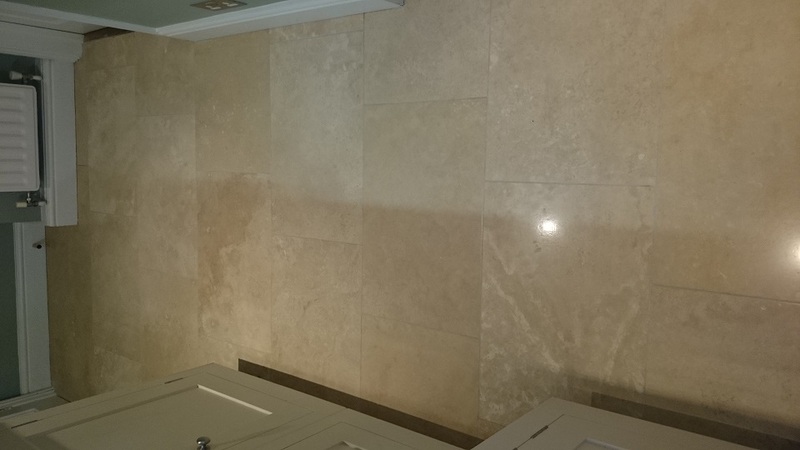 Limestone Floor Cleaning and Polishing in Sevenoaks, Kent. They were a pleasure to work with, accommodating our date changes and has done an excellent job Floors look like new! 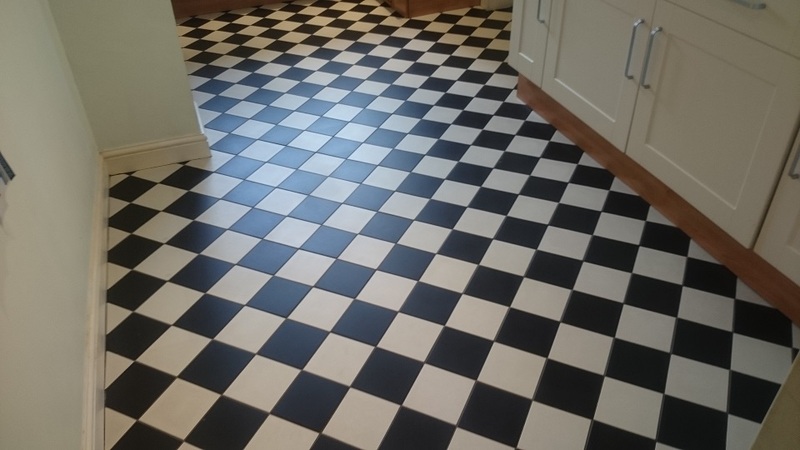 Work Details: Although the floor had not been down for more than a couple of year the floor looked dull and the shine had been taken away possible from incorrect cleaning products being used. The floor was deep-cleaned and re-polished. The customer did not want a high shine so a sheen or mid-shine was given to the floor before sealing to protect it. The correct aftercare advice was then given to protect the floor. Adrian spent 2 days cleaning and sealing all our stones of different varieties. Excellent results, would not hesitate to recommend this company. 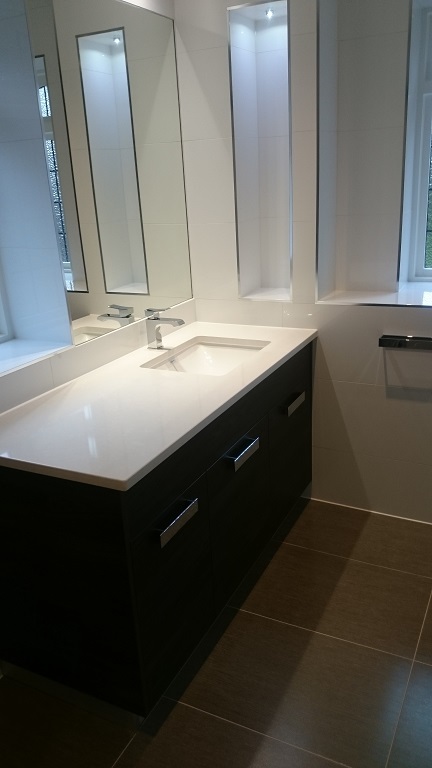 Work details: Ensuites, Bathrooms and worktop cleaning. All Porcelain & Ceramic tiled surfaces including walls and floors were cleaned washed and buffed dry. 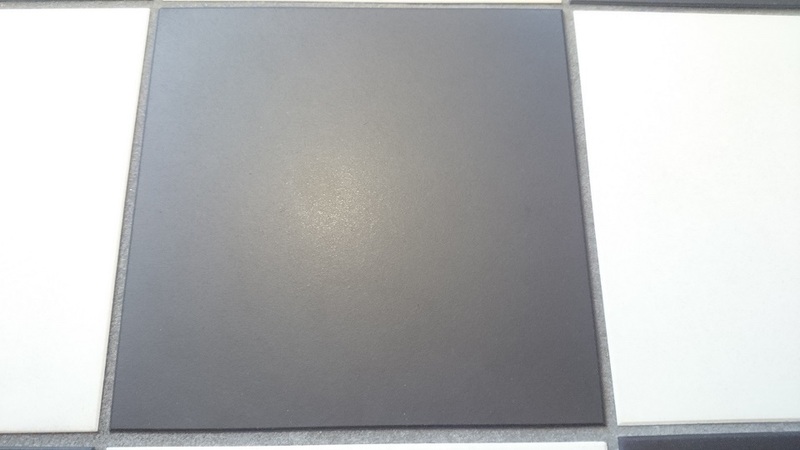 Composite stone vanity tops were deep-cleaned and re-sealed. Over time and especially if building work has been carried out, porcelains and ceramics get dirty need deep-cleaning, this brings out debris and dirt which general cleaners will not. After the above work was carried out full guidance was given regarding aftercare. Sandstone Kitchen Floor Cleaning & Sealing in Plaxtoll, Sevenoaks, Kent. Delighted with the results. My floor looks much cleaner and it has brought out the natural colours. Excellent service. – Would thoroughly recommend. Travertine Floor in Sevenoaks, Cleaned, Polished and Sealed. Adrian Has returned our Limestone Travertine kitchen floor. It looks as new and has instructed us on the after care. Very good job. After Cleaning, highlighting the grout lines After sealing. Victorian Tiled Floor, Sevenoaks, Cleaned and Sealed. We had our Victorian tiled floor cleaned by Adrian. The service was exceptional. He came to see us within 24Hrs, had the quote back to us that evening. Very genuine and completely professional. We came into a problem and he did everything to resolve it. He set very high standards for his work and I was amazed at how he care about the standard of work. I would use his services again and highly recommend his company. I am a very, very happy customer. Mrs Parish, Sevenoaks, Kent, TN14 - Victorian Floor Cleaning. Absolutely delighted with how the work come out, my travertine floor is looking like new. Good Advice on after care. 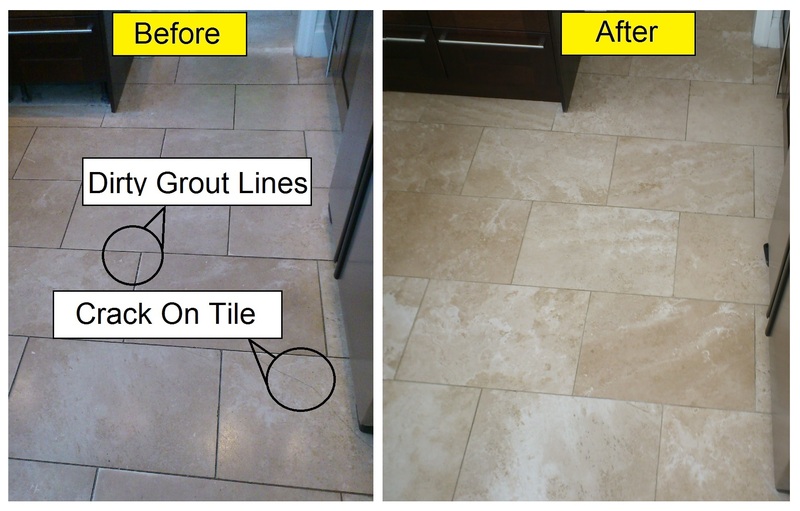 D Hines – Travertine Floor Restoration. Porcelain Floor Cleaning, Grout Line Cleaning & Buff Finish, Keston Park. Work carried out to a very high standard. Operative left at the house to work alone so inconvenience kept to a minimum. Would definitely use this company again. Travertine Floor Cleaned, polished to a high shine and sealed. 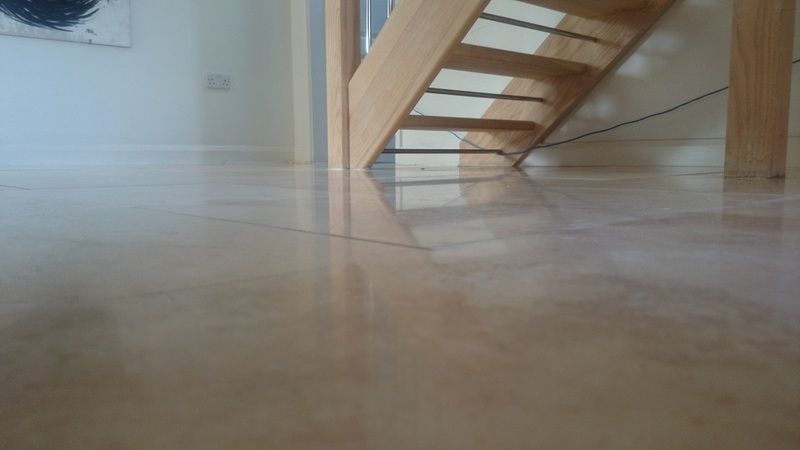 "I Was very unhappy with our travertine floor which looked mucky with many small holes. They recommended the diamond finish and I am delighted with the results. The holes have been filled and the floor looks like new. I have also received information on how to clean / the best products to use in the future. They were very friendly, polite and worked hard. I would recommend this company to others and will use them again when needed." NB. 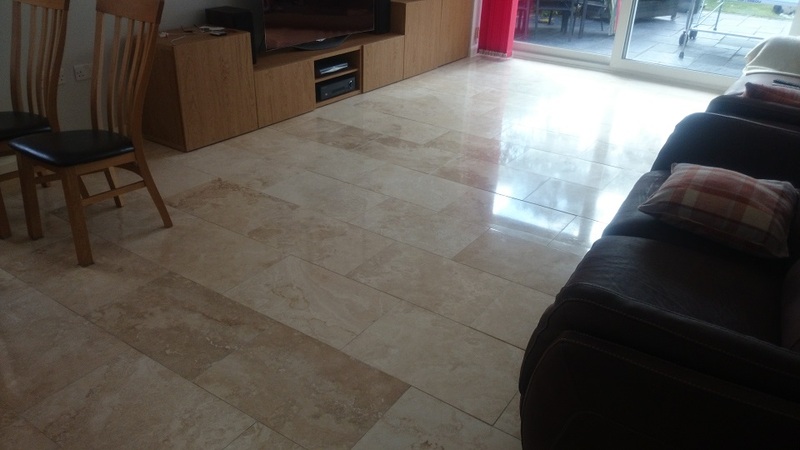 Please note it was a diamond pad polishing system which was recommended and this gives the travertine its even sheen/shine finish which the customer wanted and loved.
" Adrian worked hard and never stopped all day! The floor looks amazing and he always cleared up after himself. We felt very comfortable with him working in our home and he took great care over our furniture. Always making sure it was protected. Excellent service and would definitely recommend Thanks so much. " 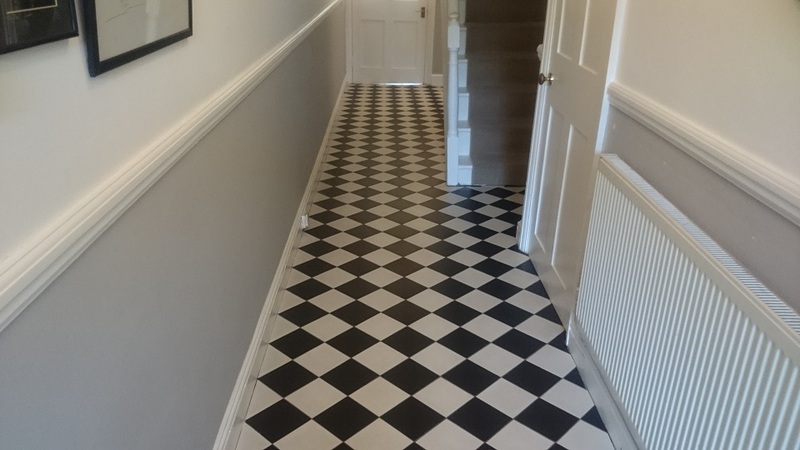 " I had my tiles polished and clean and could not be happier. They look 100 times better than the day they was finished 2 yr ago a great service. " 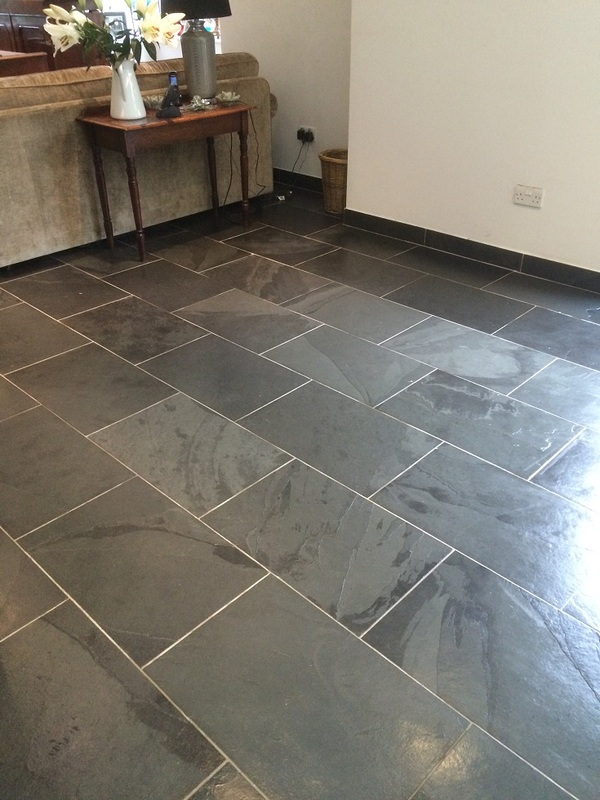 Slate Floor Clean And Re-Seal With Specialist Slate Sealer. 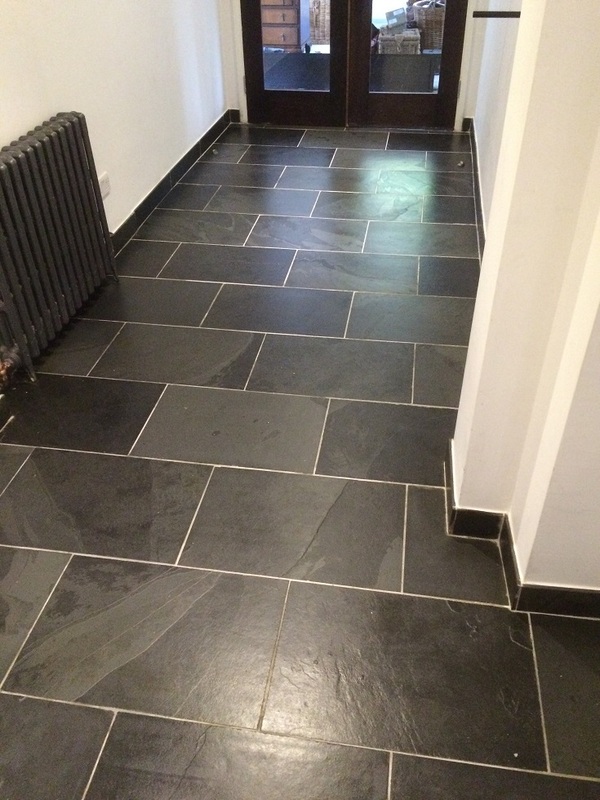 Slate floor clean and re-seal with specialist slate seal. I was very impressed by his knowledge and interest in his work to do the right thing for my kitchen. A very hardworking and efficient man, very reliable too. My kitchen looks like new and I am a very happy customer. 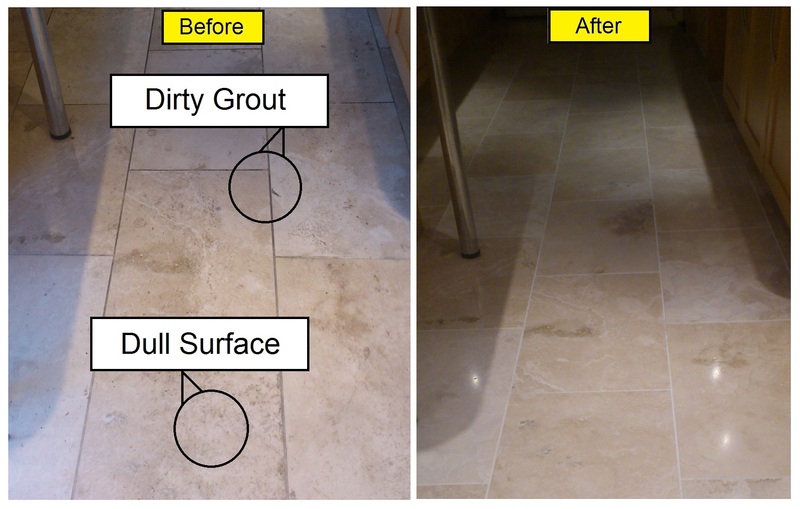 Travertine Floor Restoration – Cleaned, Polished and Sealed to protect. Absolutely Delighted with how the work came out, my travertine floor is looking like new. Good advice on aftercare. I have to admit I was a little sceptical as to what could be achieved. The floors where only down 5 years and i decided to have just one room done. By the time this room was completed I had ask them to return asap to do the rest. Marvellous results and the floors are now a thing of beauty. So shiny that even the cat thought the floor was wet and dabbed before walking! Adrian came to restore my floors downstairs, the result has blown me away, what a result WOW! The floor looks like the tiler has just finished his work. Workmanship fantastic, together with friendly faces and excellent service. My Travertine floor looks amazing. Thank you. K Fearns, Macclesfield. Clean and Polish Travertine Floor. Adrian and Lee are absolute professionals and needless to say I am over the moon with our floors. Extremely friendly guys and absolute perfectionists. I would highly recommend this company. 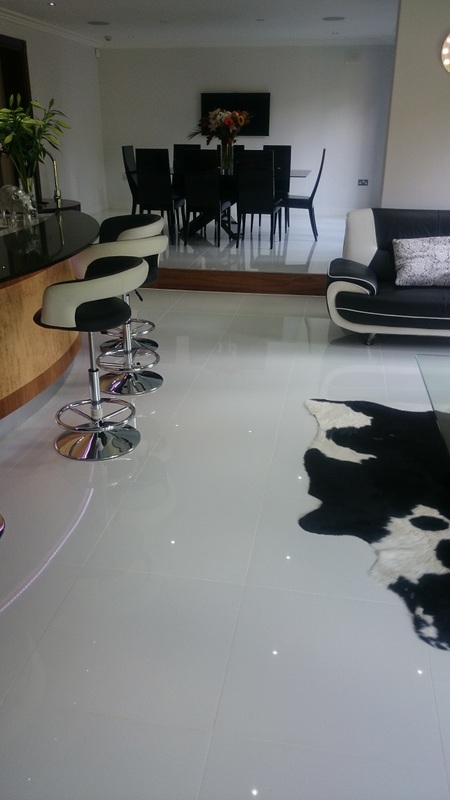 A & R Gregson Liverpool – Deep-Clean Porcelain Flooring in Kitchen, Hall, Dining Room and lounge. Two very courteous lads, Adrian and Lee did an excellent job re-sealing and polishing my baltic brown granite worktops. Very pleased, Thank you. Mrs Seddon, Middlewhich, Cleaned, Polished and Sealed Granite Worktops. They came to my employer's house to restore the floors. The team were very courteous, proficient at their job, hardworking and have done an amazing job. I know that my employer will appreciate the hard work the team did and will be very pleased and astounded with the end result. I would recommend highly to everyone! Adrian & Lee have done an amazing job. They are professional and are extremely passionate about what they do! I would recommend Absolute Care to anyone! Chantel, estate manager, Knutsford – whole of the downstairs floor including games room and swimming pool surround. 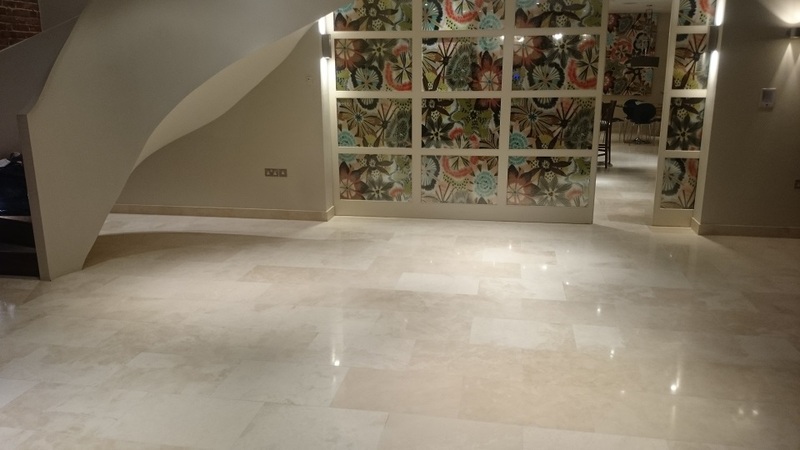 The "Team Have Recently Finished Working In My House And Done A Truly Amazing Job With My Travertine Floors. They Have Cleaned, Re-grouted And Diamond Finished My Kitchen And Dining Room. It Looks Like New - Wonderful. They Also Replaced Several Damaged And Broken Travertine Tiles, Laid New Flooring Underneath And Re-sealed Everything. I Could Not Be Happier. Thank You". - Lorraine, Alderley Edge. Job Description: The floors were not only in need of cleaning with the correct chemical but also re-polishing with Diamond pads as the shine had gone. 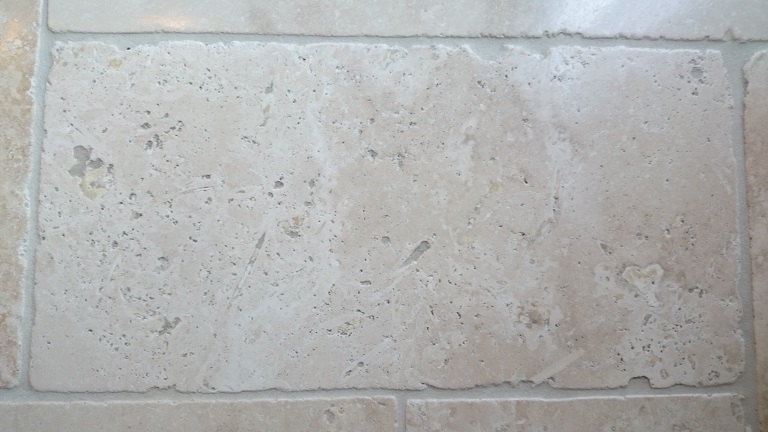 As some of the Travertine tiles were damaged and cracked these were replaced, they matched the originals beautifully. Bringing Back To Life A Granite Worktop In Goostrey, Knutsford, Cheshire.. Excellent work. Very helpful and knowledgeable, would recommend to anyone. Mr J, Mill Lane, Goostrey, Knutsford, Cheshire. Job Description: The granite worktops had been chipped and needed care and attention, they had dulled over time especially in heavy used areas. We repaired two chips which were located around the sink then deep cleaned, re-sealed and cream polished the whole surface for added protection and shine. 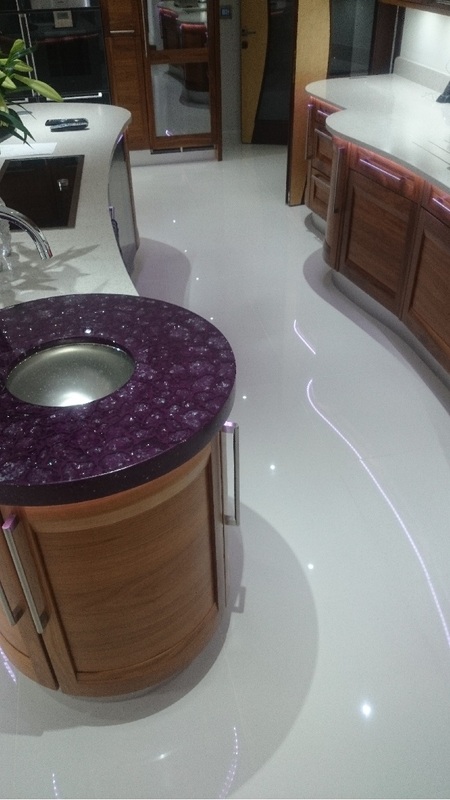 The Granite was called Verde Bahia and truly looked stunning once we had finished. The Granite worktop in total was around 7 meters in length and in total we took around 3 hours to complete. 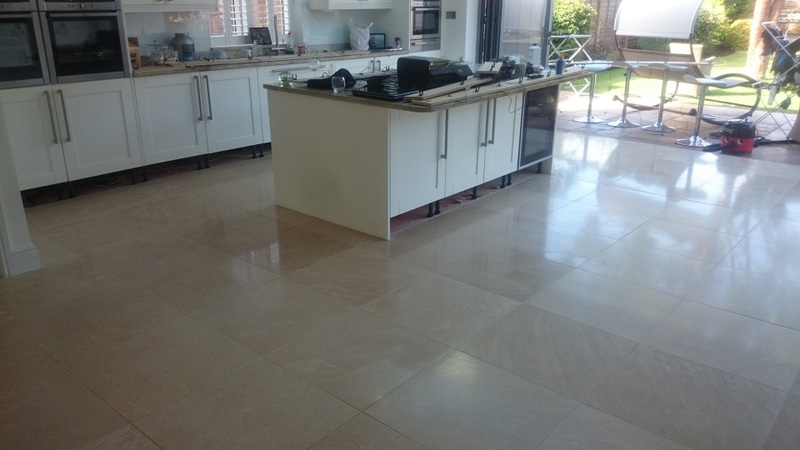 Restoration & Cleaning of Limestone & Travertine flooring in Parkfield Road, Knutsford, Cheshire. Absolute came to my employer's house to restore the floors. The team were very courteous, proficient at their job, hard working and have done an amazing job. I know that my employer will appreciate the hard work the team did and will be very pleased and astounded with the end result. I would recommend highly to everyone! Evelyn, Property Manager, Parkfield Road, Knutsford, Cheshire. Lee & Adrian have done an amazing job. They are professional and are extremely passionate about what they do! I would recommend Absolute Care to anyone! Chantel, estate manager, Knutsford. 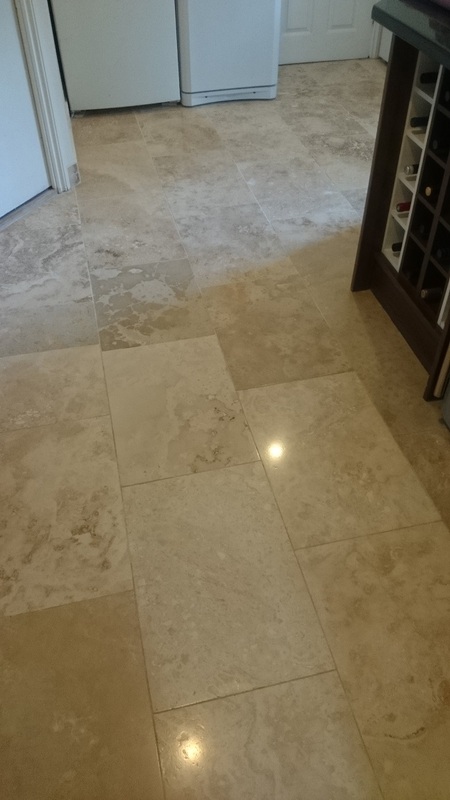 Job Description: - The light coloured limestone tiles ran thru the house (hallway, kitchen, utility, stairs, pool and bar area) it had become grubby with ground in dirt over the years and was in need of bringing back to its former glory. When we had finished it looked like new! We deep cleaned the stone and repaired some areas which needed it then re-sealed and buffed the floor until the limestone looked great. 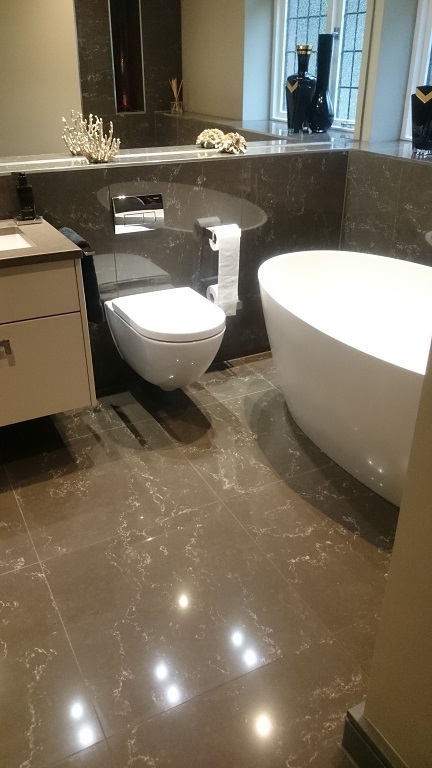 We also deep-cleaned, restored and re-sealed the bathrooms where Italian travertine was laid. Restored, filled and cleaned travertine floor. I can't believe you have brought this floor back to life. Mrs Dunne. 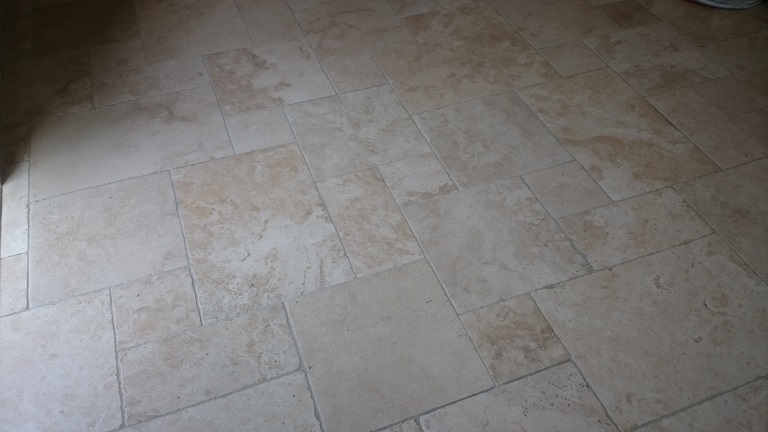 Job Description: The travertine floor was looking very tatty with some damage and although it had been cleaned regularly the floor had ground in dirt which made it look very dirty and no domestic type cleaning chemicals or techniques were working hence they called us. In total the floors in large kitchen / dining room / lounge totalled around 45 meters. Mrs Dunne also asked us to look at the Victorian mosaic tiled hallway and porch which was also looking dull and dirty, that also came back to life and as you can tell from her comments she was thrilled. Two very courteous lads, Adrian and Lee did an excellent job re-sealing and polishing my Baltic brown granite worktops. Very pleased, Thank you. Mr & Mrs Seddon, Middlewhich, Cheshire. Job Description: The Baltic Brown Granite worktop was in need of deep cleaning, re-sealing and polishing, this also included bringing a deeper shine to the drainer which was manufactured into the worktop Granite we also working on removing some slight scratches for the surface. Every testimonial is from a real person, most are taken from our Testimonial Request Form which every customer is given, these are kept and can be seen apon request. If you wish to speak to one of them then Bond & Sons will ask the person who gave the testimonial to give you a call, nearly all their customers will be happy to do so, although some may request not to partake most will happily speak to you.